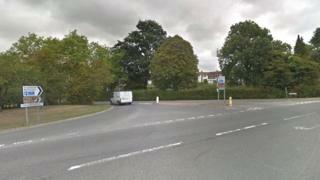 A woman in her 80s who was a passenger in a car has died in a crash involving another vehicle. The Peugeot Independence, a wheelchair-accessible vehicle, collided with a Nissan Qashqai in Cranbrook Road, Tenterden, Kent, at 17:00 BST on Saturday. The woman, who was from East Malling, died at the scene. Her next of kin have been informed.